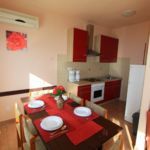 Rooms, services Apartman Arijana Dramalj is offering two nicely furnished rooms to stay in to those seeking accommodation in Dramalj. The apartment welcomes small pets for your stay for an extra fee, allowing you to take your four-legged friend with you. If neccessary, you may leave your car at the parking place of the apartment without paying any extras. Thanks to air-conditioning being in operation all rooms, you can also easily refresh yourself during warm summer days. All rooms have a separate bathroom and toilet. The exact scope of services offered by Apartman Arijana Dramalj (including those for an extra fee) and the exact equipment of a room are available on the information sheet below and on the information sheet of the given rooms. Location Sandy beach is 1.3 km, Gravelly beach 500 meters, Rocky beach 500 meters, Concrete beach 500 meters away from the apartment. Payment The apartment is offering you the following methods for payment: cash, debit/credit card, bank transfer. Apartman Arijana Dramalj is asking for 40% advance payment. Arrival, opening hours The earliest time to check in to your room is 14:00, the latest time to check out of your room is 10:00. You will be able to speak with the personnel in English, German and Croatian languages. The rating of Apartman Arijana Dramalj is 10 from the maximum 10, 1 based on actual and valid guest ratings and reviews. "Jól megközelíthető, közel a tengerpart, gyönyörű kilátás, barátságos tulaj, tiszta modern szállás"